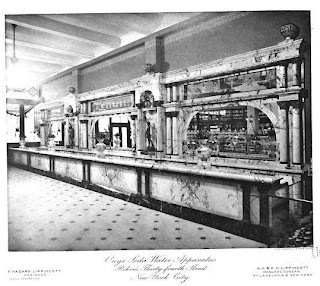 An Onyx Soda Water apparatus built by the Onyx Soda Fountain Company on 34th Street in New York City. I cannot make out the location on the photograph but it looked like quite a soda shop. 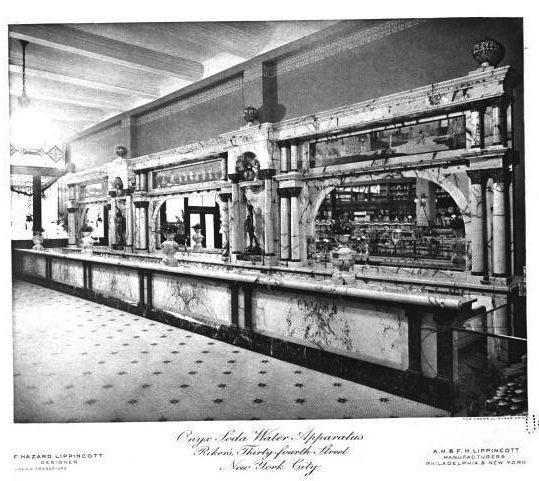 Photo from The New York Architect, 1908. How many egg creams would it take to outfit a soda shop like this? It looks like Rikeni & Thirty-Fourth Street. I've never heard of Rikeni - it sure isn't on the current maps. It would seem that the business was called Rikeni and it was located on 34th Street. But that's just a guess.